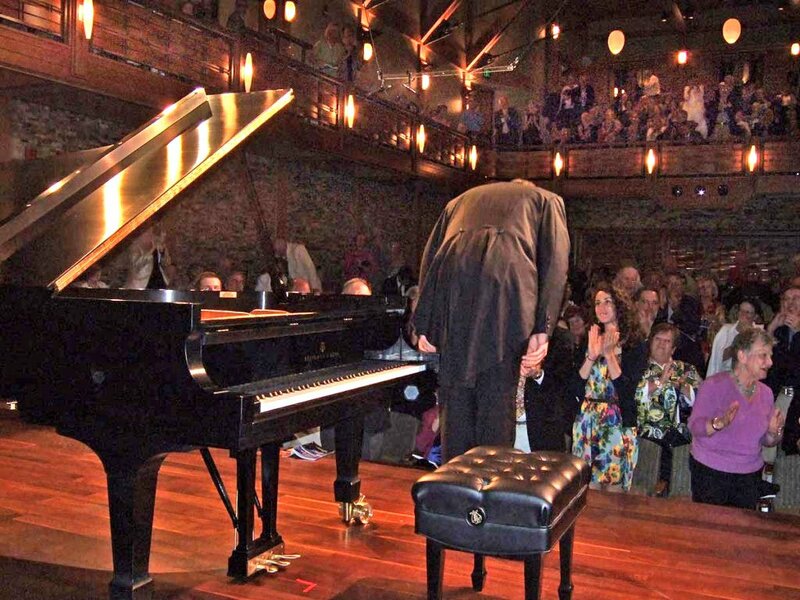 The number of piano recitals one hears that are close to wholly satisfying, close to unexceptionable, is small. But Garrick Ohlsson’s powerful and straightforward offering last Sunday, in Rockport’s Shalin Liu Performance Center, was one such. Three big important standards, a handful of miniatures: all were played with what seemed like an attractive kind of enforced muscle and imposed grace. For two days now I am mulling what I mean by that; it wasn’t effortless work, not everywhere light, yet it was playing of unusual and reliable clarity: during every movement you could, at least if you had the recording, come close to taking dictation and from it produce full notation. Not didactic, just a consequence of Ohlsson’s careful and sometimes constrained tastes, even more of his thoughtful and unhurried tempos. One of the late sonatas, Beethoven’s opus 109, from 1820, was deliberative in a way I’ve never heard before live. I found it noble, the gravitas of later Arrau (whose pompous ponderousness eventually became contemptible) combined with something like the might of Kovacevich. The Andante variations, “in the style of Handel and Bach,” as the composer’s favorite student and pal Czerny surprisingly put it, were fully sensible and fully explored, and it now made better sense that Beethoven named Handel his favorite composer. Schubert’s Wanderer Fantasy sounded even better. In fact I have never heard it better, richer, more potent, more musically engaging because so interconnected (it’s not a piece I care for like other Schubert). The playing was again immaculate and occupied with attentive reflections to a fare-thee-well. Structure was made plain, the crossed-hand passagework pointing the way, demarcations compelling not just after but before. That this Romantic monster was written only a couple years after opus 109 and some city blocks away is simply, happily astonishing. At intermission it occurred to this excited writer that a different reviewer might well find the playing not so much uncommonly sturdy but tending a bit to the plodding and unrelieved, to the almost leaden, lacking forward motion or propulsion. Those accents did not always dramatize the music into rhythmic life. Certainly Ohlsson’s Beethoven recordings show some of these static characteristics. My ear found that the pronounced ritards and section breaks, with some of the rubato moments approaching taffy-pull level as the afternoon progressed, helped, anomalously, to keep things moving along just fine. It is true that Ohlsson loves to bring out interior voices but does not exactly do interior lighting of the score so much; the playing did show several colors but perhaps not a wide range or variety of shadings of those colors; and there were not overmuch luminosity, poetry, leggero, lilt. The dynamic range was large, but somehow more noticeable was the often seemingly unvaried mezzo loudness level of this pianist on this piano in this hall. The Shalin Liu hall is itself a highly lucid space (see here), and the upstage glass wall for some reason wasn’t draped or covered by the retractable wooden lattice, so as I say, it made for an afternoon of clear power (and the customary ocean views). The loudness level was not constant but felt somewhat undifferentiated; even the soft moments carried. Hardly unpleasant, although striking, and different from other halls. Chopin’s Sonata 3 (1844) following some Griffes miniatures from one century ago—Ohlsson is a Griffes specialist—made up the second half.. It too was exemplary in all regards. It was as though Chopin was singing, often lying back with long holds and sustained, tying notes. If the beautiful and rich second movement Scherzo lacked a touch of flow and “waltziness” (yeah, I know it’s not that dance), the Largo sang more and the Finale flew just impeccably. Bravo went the packed house, and one could only concur in their take. Griffes is small beer for me, but no harm in sipping these slight pours, and Ohlsson takes them seriously.